JUBA, Jun 1 2012 (IPS) - The United Nations has warned that despite the austerity measures put in place by South Sudan to deal with its economic woes, humanitarian agencies will have to increase relief efforts in order to keep the country’s poor alive as the financial situation worsens. “It is going be the humanitarians who are going provide the assistance that is necessary to help families survive,” U.N. humanitarian coordinator in South Sudan Lise Grande told IPS. The economic crisis was triggered by South Sudan’s decision to shut down oil production, which accounts for 98 precent of the country’s revenue, at the end of January following a dispute with Sudan over fees charged to use its pipelines. The government introduced austerity measures shortly afterwards, which include cutting essentials such as investments, halving expenditure on government institutions, limiting borrowing to only fund activities that will stimulate economic growth such as infrastructure development, and intensifying tax revenue collection efforts. The government has also resorted to heavy international borrowing, acquiring a number of large loans from foreign banks in order to ease the financial crisis. However, Grande told IPS that if the government ran out of money to provide health care and education, communities would be badly affected. “We are all worried that as austerity bites deeper and deeper into households, it is going be the humanitarian agencies that are going have to step up their operations, step up their support to help those families pull through,” Grande told IPS. “South Sudan will go for as long as it takes. We have no plan to collapse as some of the people who are not wishing us well would like to believe. We have no plan to die. We are here to stay,” Finance and Economic Planning Minister Kosti Manibe told IPS. However, the cessation of oil production has led to an acute shortage of foreign currency. Consequently the local currency has declined drastically against the dollar. The official rate is 2.95 South Sudanese Pounds to the dollar, but it has plunged to five pounds to the dollar on the black market from 3.5 in January. In an earlier interview with IPS, Grande said that prices of basic commodities in border communities have risen as much as 200 percent. Consequently, fuel is now scarce and prices have increased to about 30 pounds (six dollars) per litre for both diesel and petrol, compared to six pounds before the crisis. In addition the country’s inflation rate jumped to 50.9 percent in March from 21.3 percent in February, South Sudan’s statistics office said. “Times are hard. That is true, but we have measures to deal with them and we will (survive)… just like we did during the difficult times of the war,” Manibe insisted. 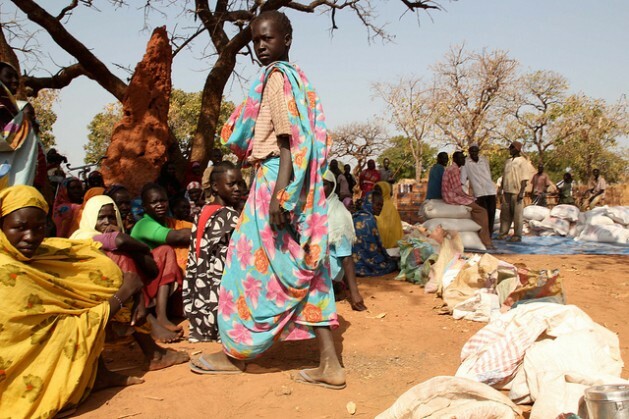 The country, which was formerly part of Sudan, was embroiled in a civil war from 1983 to 2005. However, Spencer Kenyi, an environmental economist and World Bank consultant on the private sector in South Sudan, said it was wrong for the government to use its people’s ability to endure hardships as an excuse for its failure to address the current economic challenges. “People suffered during the war but it was not their wish. They had no choice. The government needs to create some semblance of order by not only implementing policy but also by implementing the right policy to improve the lives of people,” he said. He is one of the many who have criticised the government’s decision to stop oil production saying it was taken prematurely without any prior consideration or preparation for the consequences. Meanwhile, the government has stated that is currently relying on reserves from savings it claims where accumulated over the last seven years. While the government has not revealed how much money it has in hand, it said that the funds would last for 18 months. “If these reserves run out, it is obvious that the economy will collapse. There are already a few signs showing that the system is beginning to collapse. The fact that there is no longer fuel in filling stations shows us that unless we do something drastic, the economy will soon collapse. The lack of fuel affects all aspects of our lives,” said Kenyi. Former Finance and Economic Planning Minister Arthur Akuein Chol has also criticised the government for not diversifying into other forms of revenue generation apart from oil. He said that government’s campaign, launched in May, to increase non-oil revenue tax collection by 300 percent over the next six months would not generate significant income. However, Manibe said the government’s collections in the last three months had increase fourfold. “But we also will tax non-traditional sources that we had not used before now. These include areas that were once a jurisdiction of the government of Sudan, which have now come to us like the issuing of licences. This includes licensing, for example, telecommunications, licences for concessions in the field of oil exploration and development, and licences for mining,” he told IPS. In May South Sudan secured a 100-million-dollar loan from the National Bank of Qatar to finance the import of essential goods and services including fuel, food and medicines. It is understood that the government is also in the process of securing another 100-million-dollar loan from Stanbic Bank and another 500-million-dollar loan from a yet an undisclosed source. In April China agreed to give the new country a loan of eight billion dollars that South Sudan said would be used to fund South Sudan’s infrastructure development. The exact terms of these deals have not been published, but it is understood that repayment will be tied to future oil revenues. Kenyi said that instead of borrowing money, the government should have approached international financial institutions like the World Bank and the International Monetary Fund and donor countries with which it could reach bilateral arrangements for grants. However, Kenyi warned that South Sudan’s emerging economy could suffer serious consequences if it started to rely on loans so early in its democracy. “Any money obtained in grants should not be used luxuriously. It should be used only to provide essential services such as medical care to the ordinary people and to undertake development work,” said Kenyi. A May 17 report by the campaign group, Global Witness, called on South Sudan to exercise caution and total transparency in pursuing oil-backed financing. The group asked the government to publicise details of any loan agreement to prevent exploitative terms, corruption, and mismanagement from undermining immediate benefits. Meanwhile, Grande says that the U.N. will do all it can to help those affected by food insecurity. “We will reach people with food assistance as the lean season progresses and austerity bites deeper,” she said. “The U.N.’s World Food Programme will provide food aid to 2.7 million people out of 4.7 million people who need food aid this year,” Grande added. Kenyi cautioned that humanitarian agencies could not shoulder the entire burden of taking care of South Sudan’s people. “The U.N. and other aid agencies can only help refugees and internally displaced people. I do not believe that they will feed, cloth, and provide medical care for the whole population,” he said.